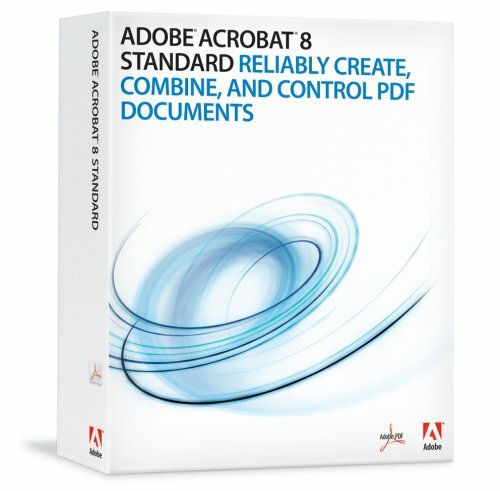 Adobe Acrobat 8 Standard for Windows software enables business professionals to reliably create, combine, and control Adobe PDF documents for easy, more secure distribution and collaboration. Combine files from multiple applications, such as text files, spreadsheets, presentations, and web pages, into a single, polished Adobe PDF document. Protect sensitive information with passwords and permissions, and conductcollaborative document reviews by e-mail or server. Create an Adobe PDF document from Microsoft Office, Outlook, Internet Explorer, or any application that prints. Easily convert and optimize documents, spreadsheets, e-mails, and websites to more secure Adobe PDF files that preserve the formatting and integrity of the original files. Share information with anyone using free Adobe Reader software. Acrobat lets you combine files from multiple applications into a single Adobe PDF document. Easily assemble documents, spreadsheets, presentations, e-mails, web pages, and forms into a single Adobe PDF document. Present files in the order you want them, regardless of file type, paper size, or orientation. Accelerate feedback and approvals with robust tools for initiating, managing, and tracking document reviews. Reviewers can use familiar commenting tools&#151;including sticky notes, stamps, highlighter, pencil, strikethrough, callout, dimension lines, shapes, and clouds&#151;for review and markup of Adobe PDF files. Merge feedback into a single file to reconcile comments. Digitally sign and certify documents to validate they came from a trusted source. Control access to and use of Adobe PDF documents, assign digital rights, and maintain document integrity. Set document permissions to define whether a file can be printed or changed. Apply passwords to help restrict document access. Digitally sign documents to manage their status and help prevent changes. Certify documents to validate they came from a trusted source. Create and reuse document control policies to precisely manage who can print, save, copy, or modify a document. Combine multiple files into one PDF package &#151; Combine multiple files into a searchable, sortable PDF package that maintains the individual security settings and digital signatures of each included PDF document. Manage shared reviews &#151; Easily conduct shared reviews &#151; without IT assistance &#151; that allow review participants to see one another's comments and track the status of the review. Archive Microsoft Outlook e-mail in PDF &#151; Configure Acrobat to automatically archive e-mail in Microsoft Outlook for easy search and retrieval. Archive Lotus Notes e-mail &#151; Convert e-mail in Lotus Notes to Adobe PDF to facilitate searching, archiving, and retrieval. Take advantage of a new, intuitive user interface &#151; Complete tasks more quickly with a streamlined user interface, new customizable toolbars, and a "Getting Started" page to visually direct you to commonly used features. Remove hidden information &#151; Inspect PDF documents for hidden information, including metadata, annotations, attachments, form fields, layers, and bookmarks, and selectively delete as needed. With a scanner and Acrobat's Optical Character Recognition (OCR) technology, you can turn stacks of paper documents into easily searchable electronic PDF archives. Enjoy enhanced OCR capabilities &#151; More accurately scan paper to generate searchable Adobe PDF documents with the newly enhanced OCR engine. Save in Microsoft Word &#151; Take advantage of improved functionality for saving Adobe PDF files as Microsoft Word documents, retaining the layout, fonts, formatting, and tables. Use enhanced review and markup tools &#151; Take advantage of enhancements to review tools, including a single, organized toolbar and easier, more accurate placement and resizing of markup items. Create in PDF/A for archiving &#151; Create documents in PDF/A, the ISO standard for long-term archiving of electronic documents. Combine documents, drawings, and rich media content into a single, polished Adobe PDF document. Arrange source files in any order regardless of file type, dimensions, or orientation. Create Adobe PDF documents with one-button ease from Microsoft Internet Explorer and Microsoft Office applications, including Access, Outlook, and Publisher, as well as Lotus Notes. Product wasn't in original packaging, missing the books. End users like that sort of thing. Adobe has a habit of making sure their new products break their old ones, thus forcing you to upgrade. Try editing a pdf in Acrobat Professional v5.0 Seems to work... but you can't print it from any of the newer versions of the reader. Oops. And did you ever have the pdf writer? If so, you may have noticed that a fairly recent upgrade of the Reader disabled your installation of the writer. Hmmm... now why would that happen? Time to upgrade, I guess.